Water seepage and dampness are unavoidable in the Monsoon season. However, these can seriously harm both buildings and materials within them as well as cause health problems. One way to prevent the ill-effects of humidity is by investing in proper waterproofing measures. This includes roof leakage solutions, terrace waterproofing, basement waterproofing, drain construction, etc. It is important to look for the waterproofing contractors in Bangalore who can suggest the right kind of waterproofing according to your house. This article will help you understand what waterproofing is and why it is a necessary part of house building and maintenance. Waterproofing is the practice of making a surface water-resistant or impenetrable by liquids to preserve the strength and durability of a building. It is a measure taken in the construction and design industries to stop the invasion of soil moisture, liquid water, and water vapor into a building under hydrostatic pressure. There are different waterproofing techniques available such as cementitious waterproofing, bituminous coating, sheet membranes, polyurethane liquid membranes, etc. Read on to know the list of reasons why you need waterproofing for your home. In a country like India which is affected by the sporadic Monsoon season, there is always the chance of your home getting flooded because of heavy rainfall. When you have a waterproofing method in places, such as an operational drainage system or a water resistant sealant, you can protect your home from water damage and extra costs incurred in repairing the damage. 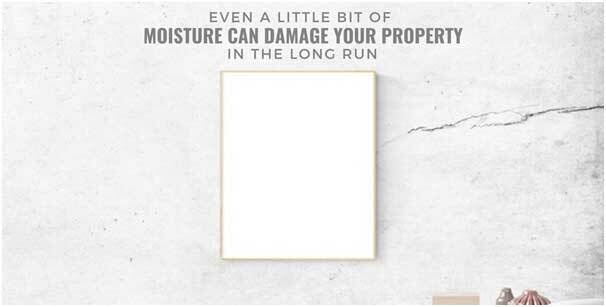 Even a little bit of moisture can damage your property in the long run. It can result in cracks being formed in the floor and walls which weakens them as well as results in rotting. Without waterproofing, the basement can get compromised due to excessive moisture from hydrostatic pressure or upward pressure of the groundwater. This can impair the sturdiness of the foundation which is a serious threat. Along with water damage, moisture can also cause spalling and acid damage. Spalling is when the concrete on the surface starts to chip and fall apart. This could be a sign of a severe need for waterproofing. Acid damage, on the other hand, is the formation of brown or rust colored stains, and marks on the floor or walls. This happens when water is pushed through a wall or floor, and the minerals are left behind. This can eventually cause irreversible damage over time. An increase in humidity can also cause rotting of support structures made of wood. This can create sagging floors or collapsed walls. Further, waterproofing the area around your house, i.e., where the walls and floors, will make it less prone to shifting and prevent foundation cracks. Just the presence of moisture in the air can cause your house to feel warmer in the summers, affect paper products, damage metal objects by speeding oxidation and can generally tarnish your valuables. To prevent increased humidity, it is essential that you waterproof the foundation of your house since water vapor travels upwards on evaporation. 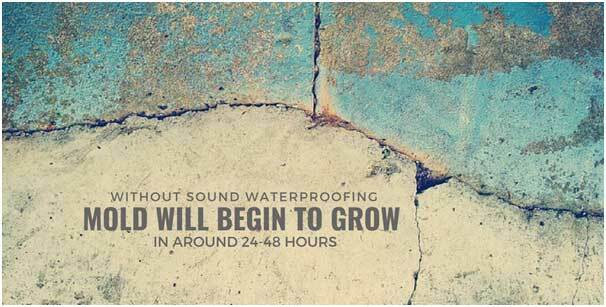 Without sound waterproofing, mold will begin to grow in around 24-48 hours of water entering a house. The hot and humid environment of a basement is also perfect for the growth of mold and mildew. Mold and mildew bring down the quality of air in a house and also cause respiratory infections, skin irritation, asthma, eye infections, coughing, wheezing, and breathing problems. Dust mites have also been known to thrive well in humid living spaces. These cause allergies and other infections. Other insects and pests are also bound to flourish in damp surroundings. 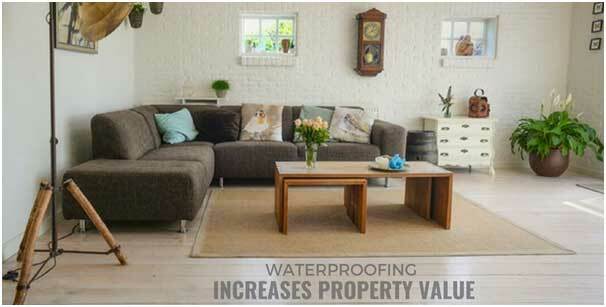 The investment you make in waterproofing your house will pay for itself. Waterproofed exteriors and interiors add value to your property since this makes renovation and furnishing easier. It adds extra protection thus reducing maintenance costs in the future. All this makes the house much more desirable in the eyes of a prospective buyer. It has been seen that even basement waterproofing problems can reduce the property value by around 20%. During the summer, humidity from the basement will rise up. This humid air costs more to cool. Whereas, during the winters, cracks in the foundation and walls will let in cold air despite your best efforts to maintain heating. This can be prevented by ensuring proper waterproofing mechanisms are in place in your basement. In fact, your energy bill can reduce by 10-15% annually if your house is waterproofed. Water damage caused by faulty waterproofing includes foundation cracks, flooding damages, rotted wooden beams, etc. These constitute about 20% of all insurance claims and are therefore quite a significant amount. A small investment in waterproofing can prevent these damages and make sure homeowners don’t have to spend that much money on insurance claims in the long haul. Water does not only cause damage to the building but also results in health hazards. Now that you know why waterproofing is needed in your house, you can start looking for waterproofing services providers in your area. Be sure to employ the right kind of services according to the weather and the specific condition of your home.